A prostrate plant with 4-angled ,greyish branches and compound leaves. All parts of the plant bear 2-armed or branched hairs, although there are few on flower. 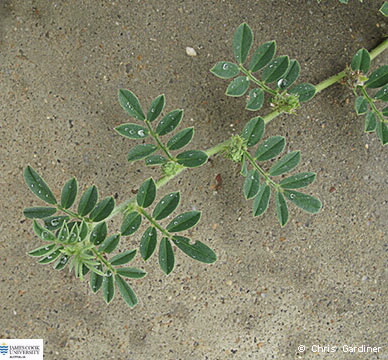 Leaves have 5-9 leaflets, greyish-grey, leaflets to 14 mm long and 2-8 mm wide. Flowers borne in axillary clusters, standard reddish. Pod straight, cylindrical , to about 5 mm long; each pod contains 2 squarish seeds. This plant is toxic to horses but palatable for cattle and sheep.